As a small girl I was fascinated by my (Morna McLellan) godmother’s painting of Sable Island and the story she told of this island of dunes, wild horses and shipwrecks. A family friend, Barbara Christie, captivated me with her stories of horses and of Sable Island. The word I have always linked with Sable Island is magical. I have always wanted to walk on the sands amongst the dunes and commune with the horses. I love to be with horses. Today I work with Polar Star Expeditions. Our small expedition cruise ship seeks out these remote places from Antarctica to the Arctic. This year we offered our first Atlantic Canada cruise that included Sable Island. It sold out quickly! And so my dream came true. As we began to bring passengers ashore by Zodiac, large seal faces bobbing in the water watching us quizzically as if highly entertained by these human antics. My friend Stella hugged me in great excitement that we were actually landing here. It was a beautiful day yet Mother Nature let us feel her power with a wicked beach surf that challenged our Zodiac operations. Perhaps I forgot my watch on purpose this day as I set off along the track with my camera and breathless excitement – I felt a sense of timelessness and wonder. (My husband found me later to get me back to the boat on time!) The grandeur of the dunes was almost overwhelming, I felt surrounded by purity. After I got to the fresh water ponds at the west end of the island I was rewarded. I crouched in the sandy track with horses milling about. With my camera I tried to capture the essence of the moment… the closeness, images of tangled manes, family interactions, healthy horses in a natural oceanside setting. A small family appeared over the rise of a dune. Then a stallion I thought to be of another family ran them off. At one point I was so busy watching one group that I was unaware that I was pretty well surrounded by various horses. One was so close that I felt her curious snuffling and I seemed to get lost in the depth of her clear dark eyes. They seemed completely unafraid of me and I was totally unafraid and happy amidst them. I am amazed this place exists – it is so precious. I was so pleased to meet Zoe Lucas and Gerry Forbes. I had heard of them both from family and friends as well as through articles and documentaries of Sable Island. They were so welcoming and helpful. Thank you, Zoe and Gerry. My husband and I have an offshore cruising sailboat, Gypsy Mare. I now dream of returning to Sable Island. It was everything I had dreamt of – wild and pure… and magical. 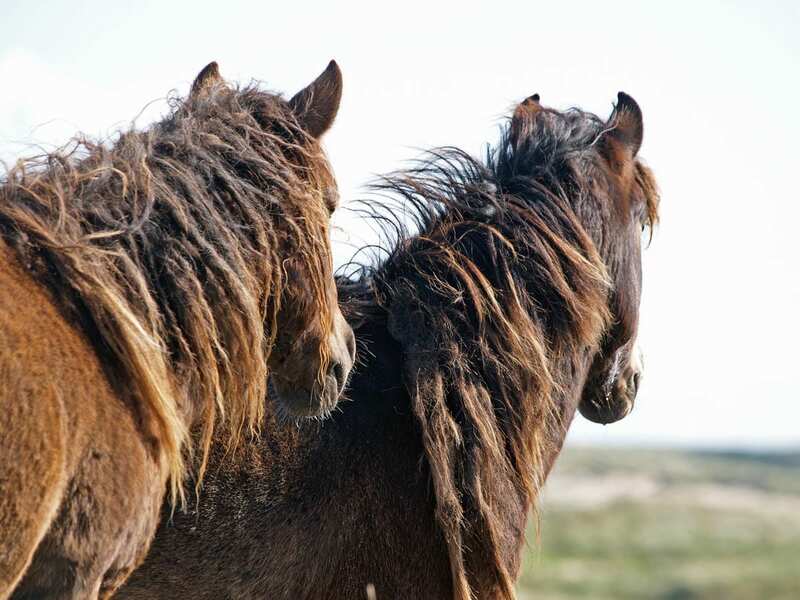 Image: Two Sable Horses, photo Mary Filbee.